My One Word for 2014 has been bigger than I am. All while being kind of mysteriously unsettling, yet exciting. It’s a word rarely used in the places I hang out. When was the last time you worked that word into your conversation? A word like jubilee doesn't just pop into your mind and make you feel all warm and fuzzy like some words. Honestly there are so many nice words I could have gone with, such as: focus, love, or grateful. Well, actually I believe the One Word chose me. Even as I type, I am more convinced than ever, that God gave me this odd word, jubilee and He is still unfolding what that means in my life. Historically the Year of Jubilee, comes every fiftieth year and was to be observed by God’s people. It was how God protected His people from ever permanently losing their freedom or inheritance since all debts were to be forgiven and slaves were set free. What would happen in our world if that happened? From what I've read, the Year of Jubilee is no longer observed because all the tribes of Israel do not currently occupy the land they were given in the Old Testament. May I just suggest this? I think there are lots of people who believe in Jesus who aren't occupying their promised land either. People like me. 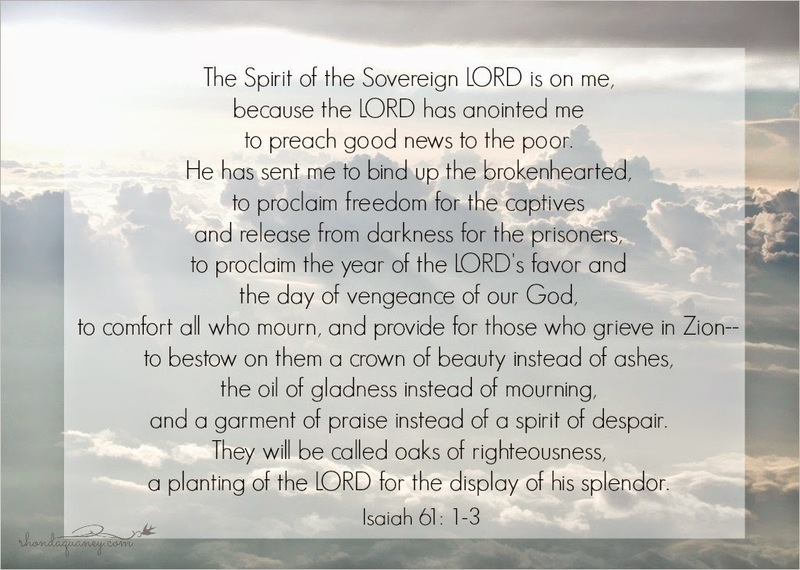 When I first came to trust in Jesus I claimed Isaiah 61: 1-4 as verses that spoke to my life calling. It would be years before I understood that Jesus himself began His ministry by quoting from Isaiah 61, verses 1 and 2. I found it interesting that this source claims that His official ministry began on Wednesday, September 11, 26 A.D., the Day of Atonement, which began.... the Jubilee year. And I’d say, that this Year of Jubilee thing, was important to Jesus, so it is still important. Part of the problem for me, was to apply this word, jubilee, to my 21st century life. What I knew about the word jubilee, was that this was a time of great rejoicing and liberation. A time when things are returned to their rightful owners. A time when poor people are set free. So in the beginning of 2014, I scribbled down a simple prayer asking God to truly set me free. Less than a month later I was flying home from attending the IF:Gathering and this song popped up on my i-pod. "A time of jubilee is coming." "A time when young and old return to Jesus." That is the message of this song. Flying high above the clouds, can I just tell you that it was a very moving thing to let the words of this song pulse over my soul? It has been like an anthem for my year. It was as if God Himself sent me a reminder that He was in it all. He was in all the stuff that has made up my messy life. He has not forgotten all the things that have ever, ever happened. It gave me a deep sense that it was past time to get ready and live free, so that others could find their way to Him and live free too. I had some ideas what freedom would look like in my own life. I wanted to be debt free, lose some weight and throw off some things in my life that hinder how I walk with the Lord. That would have been a very human approach to what freedom looks like. What has happened is that the Lord has been lovingly speaking to me about things in my heart and how those things translate in my daily life. He has revealed places that I compromise. Things I considered, not a big deal, He has spoken to me as important. There has been a transformation in my thoughts and tests of my integrity. All of which has shaken up my self-life. The life I live when no one else is looking. So every little thing I do matters. I'm not talking about perfection, but I am talking about making one sincere integrity choice at a time. It matters how I speak to the clerk in the slow check-out or that I am kind to people who were unkind toward me. And forgiving people, there is always that. And there is the hope that others will forgive me too. There was a matter that God put on my heart to go apologize to someone I had wronged over thirty years ago. It involved returning something. Someday I hope to write more about that. It didn't seem like a life changing thing, but God clearly placed it on my heart to do. Obedience brings peace is all I know. At Thanksgiving there was an email I felt prompted to send. Just a few kind, heart-felt words to someone who had been a source of deep pain toward me for years. I didn't expect a response. I didn't get a response. Still I felt it was something that God was asking of me, so I have tried to obey in love. So many daily choices seem insignificant. Mostly there is my normal response and there is the one that fly's in the face of my flesh and is grounded in love. This has been a year to release the outcomes to the Lord. A year when people’s opinions have lost their power. In fact that has been a huge-little thing. God revealed how I've always wanted the acceptance of certain people. Even as a little girl, I can recount the people and times I longed for acceptance and it was withheld. And as an adult some of my deepest wounds have come from people who I loved, not loving me back. People’s opinions have lost their power but God in His mercy has replaced an attitude of hardness toward those who reject me, with a feeling of honest love and prayer on their behalf. This year, I have more deeply embraced that there is never condemnation with Jesus. Someone does need to hear that. Whenever He brings up things in my heart that needs transformed, He does it with deep love and for His glory. Never for shaming. No matter how others treat me I serve a God who has given blood-bought promises for all who believe and I can trust His love for me. Friend you can trust His love for you too. It has been in these small things that freedom has found its way into nooks and crannies of my heart that I had no idea were keeping me captive. There has been a huge shift in my life of doing things. I would rather make a decision, take action and be wrong, than sit around doing nothing. Maybe the word, “wait” will be for 2015? Many things in my life are fairly public and I have felt a shifting to do many things that would be unseen. In all this, self-preservation or being concerned about self-promotion have faded. My year of jubilee has been a year of yielding. Yielding my ideas of what I want God to do, and being more attentive to what He is doing. There is so much power and freedom in that friends. Surrender seems like you lose, but it is what brings the victory. I’m grateful that the Lord has given me the platforms He has. Things like this blog are a gift where I can write words that bring Him glory, yet if God wants to advance it or shut it down, that is up to Him. Even though I adore you all, I’m not writing for the accolades of people. These have been days of developing my inward-life which has brought freedom in my outward life. I haven’t arrived, I’m just on the journey of untangling the junk and allowing God access to my whole heart, soul, mind and strength. One more kind of interesting piece of information that came up about The Year of Jubilee? Some believe that a Biblical Sabbatical Year began on September 25, 2014 and runs until September 13, 2015. This source contends that the 70th Jubilee will begin on September 23, 2015. These things are bigger than me. The study of eschatology is too much for this one wife, mom, grandma, & lover of Jesus. But I know this; what was important to God in Genesis through Revelations will be fulfilled at some point. And somehow Jubilee is part of that. The event on the calendar and the right-now reality. Ultimately the Year of Jubilee is a foreshadowing of the Ultimate Jubilee. The Day when we are all truly set free, all things are redeemed and everything is turned back to the rightful owner -which is Jesus. And today is the day the Lord has made. 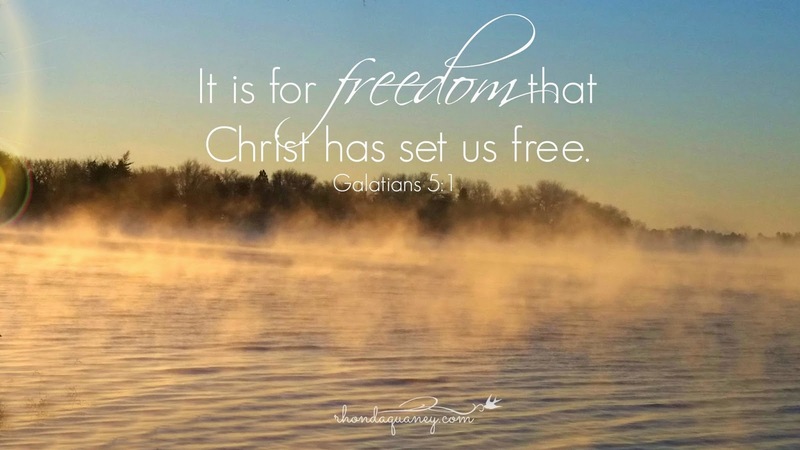 It was for freedom that Christ has set us free. As we wrap up another year, may we follow Him fully and embrace His deep love for us. It is in that, we will find true freedom. I hope you know the One that loves you so deeply. May we not only know Him, but may we be people who walk in freedom. Someone please blow a rams horn? Check out how this woman is spreading beauty?